UPDATE (9:50 AM): Yup, City scored a touchdown, defeating Arsenal 6-3. You're welcome. In just over eight hours, Manchester City Football Club takes on Arsenal in a clash of the titans in the Barclays Premier League. While City are the favorites to lift the trophy in sports books, their inconsistent road form sees them in fourth place while the brilliant play of Arsenal has them atop the table. With that said, you should really bet lots of money on City to win tomorrow. The Blues are at -130 to win outright against the Gunners tomorrow at the Etihad, which is a steal when you consider City's home form this season. 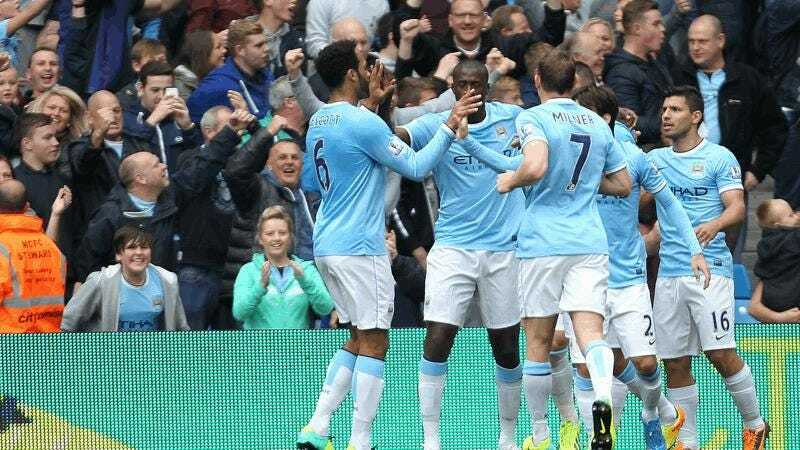 They are a convincing 7-0-0 at the City of Manchester Stadium Etihad, with a goal differential of 29:2. That's not a typo. Twenty nine to two. They've scored two touchdowns at home this season, hanging six goals on Tottenham, and even converting an extra point in a 7-0 win over Norwich. While neither of those teams are on the level of a really good Arsenal team, it would be a huge upset if Arsenal knocked off City. Most importantly, you should bet City because of the amazing odds. Betting just $130 to win $100 on a team that good on their home field is a steal when you consider that betting on the Jaguars +5.5 against some random NFL team would only be $20 less of an investment. So, to review, bet money on Manchester City and, when you wake up in a hangover-laden stupor, you'll have more money than you did previously.